Greg Robinson, editor of “Pacific Citizens: Larry and Guyo Tajiri and Japanese American Journalism in the World War II Era,” will speak at the Japanese American National Museum, First and Central in Little Tokyo, on Saturday, Dec. 1, at 2 p.m.
Offering a window on a critical era in Japanese American life, “Pacific Citizens” collects key writings of Larry S. Tajiri, a multitalented journalist, essayist, and popular culture maven. He and his wife Guyo, who worked by his side, became leading figures in Nisei political life as the central purveyors of news for and about Japanese Americans during World War II, both those confined in government camps and others outside. The Tajiris made the community newspaper The Pacific Citizen a forum for liberal and progressive views on politics, civil rights, and democracy, insightfully addressing issues of assimilation, multiracialism, and U.S. foreign relations. Through his editorship as well as in articles and columns in outside media, Larry Tajiri became the Japanese American community’s most visible spokesperson, articulating a broad vision of Nisei identity to a varied audience. 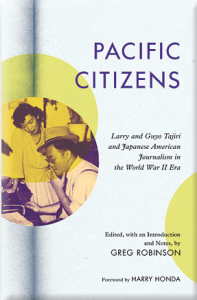 “Pacific Citizens” contextualizes the Tajiris’ output, providing a telling portrait of these two dedicated journalists and serving as a reminder of the public value of the ethnic community press. Q&A to follow with Dr. Robinson and former Pacific Citizen Editor Harry Honda, who wrote the book’s foreword. “Pacific Citizens” is available in the Museum Store.